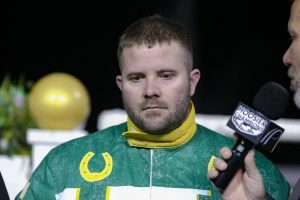 Trainer Tyler George completed a hat trick Tuesday, April 16 at Harrah’s Hoosier Park. The training triple boosted the George Stable into the top five on the leading trainer standings for 2019. George, teaming up with driver Trace Tetrick, started off his evening with a win in the first race, a division of The Irish Omen claiming series, scoring the win with Virgin Storm. Tetrick moved the three-year-old Always A Virgin gelding to the lead at the head of the lane and stretched out to a three and one-half length victory. George’s second win on the night came in the fifth race with Jin’s Shark, an eight-year-old Four Starzzz Shark gelding. As the heavy favorite. Tetrick kept Jins Shark close throughout and flushed out around the final turn before grinding it out to the wire in 1:51.3 in the $20,000 claiming event. The final win of the evening for the George Stable was in race eight with Latest Desire in a $30,000 – $40,000 Claimer. Tetrick used similar tactics, staying close throughout the race before tipping out and rolling home for the win by one and one-half lengths in 1:50.4. George has already scored 44 wins this year and is nearing the $500,000 mark in purse earnings. To date, he has won 839 wins in 3,419 starters from his barn. Jeff Cullipher has a slight lead in the standings with nine wins compared to a three-way tie between Walter Haynes Jr., Charlie Stewart and Trent Stohler with seven wins apiece. The triple win night for Tetrick also placed him in the lead in the driver standings. He now has 22 wins over Sam Widger, who has scored 21 victories. John DeLong is currently in third with 14 wins.